1 flashed mine with your guide, working fine, thanks a lot. IF YOU ARE USING STOCK MIUI ROM, THIS RECOVERY WILL BE OVERWRITTEN BY MIUI RECOVERY ON THE FIRST ROM BOOT! MAKE SURE YOU INSTALL ANOTHER ROM LIKE XIAOMI.EU BEFORE REBOOTING. If you are using the STOCK MIUI ROM, you will need to remove the file "/system/recovery-from-boot.p" using the file manager inside TWRP or otherwise it will get replaced with the stock MIUI recovery. This is the stock TWRP recovery without modifications. It's ported from the Xiaomi Redmi Note 4 to our device. It doesn't have any changes apart from the necessary to make it work in the MI MAX 2. Contrary to the one made by xuefer (the one I used until I compiled my own), this one doesn't ask you for the language every time you start it up, just like an official version of TWRP. If you have any questions, leave them in a comment. Thanks! 1) Download the latest version from the download section below. 2) Make sure you have ADB and fastboot installed in your computer. 3) Put your phone into fastboot mode (Power off, then press POWER + Vol. down until the fastboot screen appears). 4) Connect the phone to your computer and open a command line. I already have the bootloader open, drivers installed and usb debugging enabled. Restart in recovery mode and I get the recovery of Miui. 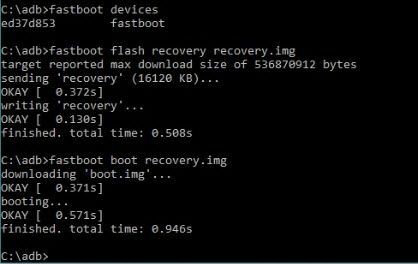 try to "fastboot boot recovery recovery.img" and then copy the recovery.img file to the sdcard and flash the recovery from twrp. Make sure you are replacing the "recovery.img" with the proper file location and name!! this one need unlocking bootloader right? you didn't mention to unlock the BL ? Nothing. Everything remains the same. Yes to everything. The bootloader unlocked yesterday, after waiting 72 hours. As you can see in the image of the previous post says to everything ok. I use the image of this post. But nothing. My rom is Miui 8 Global 7.7.20 Beta.